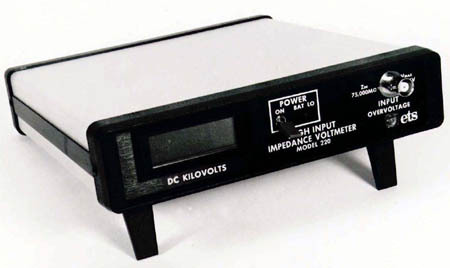 This is a High Input Impedance Voltmeter with 70 Gigohm input impedance. Capable of measuring up to DC voltage up to +/-5.5kV with 1.0V resolution over a range of himidity and temperature, the meter measures with better than 1% accuracy without loading the power source. Its compact size and light weight body allows applications in laboratory and field work when powered by battery. The equipment is external transcients and overscale inputs, housed in an aluminium enclosure. Excessive voltage input and low battery condition is indicated by LED.